A novelty in Munich 2008. Crystals and groups of crystals of this rare phosphate. 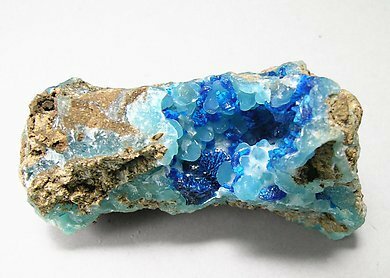 They are very well defined, very deep blue in color and on botryoidal growths of light blue Hemimorphite. The locality had been well specimen has been reviewed, photographed and published as a novelty from Munich 2008 in the magazine ‘Lapis’ on identified, which is not very common with Chinese specimens. The page 46, volume 33, number 12, December 2008 as well as the magazine ‘‘Mineral Up’’ on page 33 in number 2009/1 and ‘Rivista Mineralogica Italiana’ on page 138 in number 2009/2. A novelty in Munich 2008. Crystals and groups of crystals of this rare phosphate. 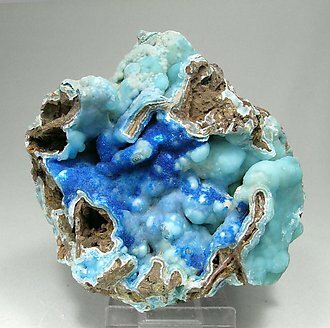 They are very well defined, very deep in blue color and in botryoidal growths of light blue Hemimorphite. The locality had been well identified, which is not very common with Chinese specimens. Very sharp and elongated Veszelyite crystals, a rare copper and zinc phosphate. 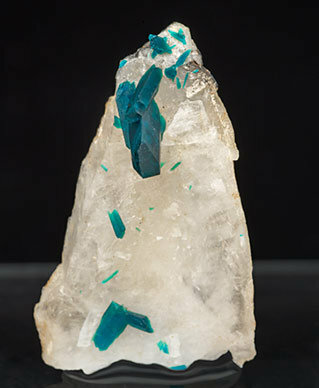 They have a considerable length for the species, have very well defined faces and are on a Quartz matrix. An excellent miniature from a locality that is a classic for the species.